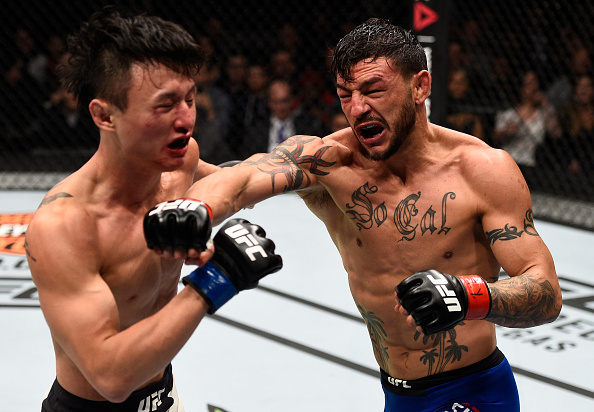 Fireworks are expected in the main event of the UFC's first visit to Fresno on Dec. 9 as perennial featherweight contender Cub Swanson puts his four-fight winning streak on the line against unbeaten rising star Brian Ortega at Save Mart Center. The UFC Fight Night card will air live on FS1. The No. 4-ranked contender in the 145-pound weight class, Palm Springs' Swanson has defeated Hacran Dias, Tatsuya Kawajiri, Dooho Choi and Artem Lobov during his recent streak, and now he has his sights set on putting the first loss on the record of Los Angeles' Ortega, a Brazilian Jiu-Jitsu black belt with an evolving striking game that he's used in wins over Thiago Tavares, Clay Guida and Renato Moicano.